Happy Sunday, friends. I hope you all had a great, relaxing weekend. I know I did. Last weekend was a lot of fun with Greyson home and some excellent pool time and crisping in the sun. This week was challenging at work (aren't they all? ), and this weekend Greyson was back to his dad's, so I spent a great deal of time in bed coloring, reading, and watching Gilmore Girls. I had my bestie from work over to the house on Friday night. We had quite a few adult beverages and were fairly silly. Yesterday I started coming down with a summer cold. Aren't they the worst? So much for breathing! There's been much coloring going on. 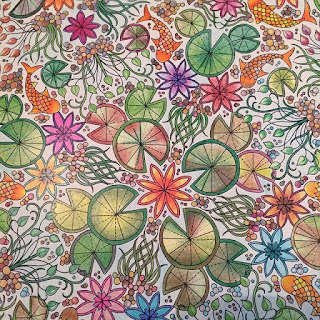 The pic above is detail from a page in The Secret Garden, by Johanna Basford. This booger was so intricate, it took me a week to color it all. These three are from this weekend. 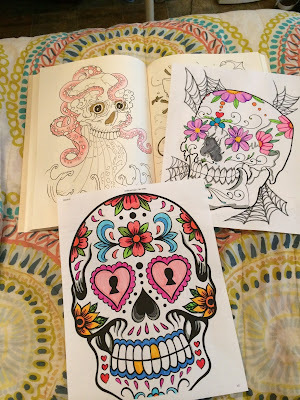 The sugar skulls are both printable pages I used because I wanted to play with a new marker set I picked up this week without worrying that they'd bleed through to the next page. 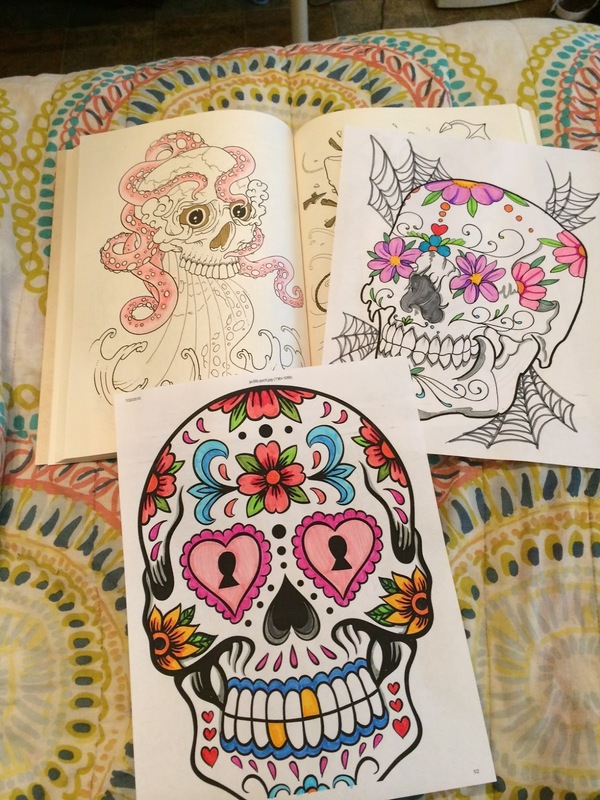 The skull with the octopus wrapped around in the back left is from The Tattoo Coloring Book by Oliver Munden an Jo Waterhouse. 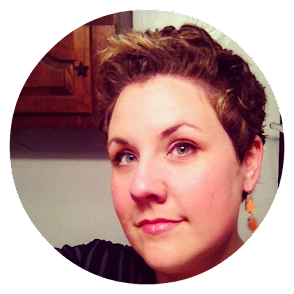 Follow me on Instagram if you're interested in more coloring (and makeup and kids and selfies and life). On the reading front, I've picked up my game just a tad. 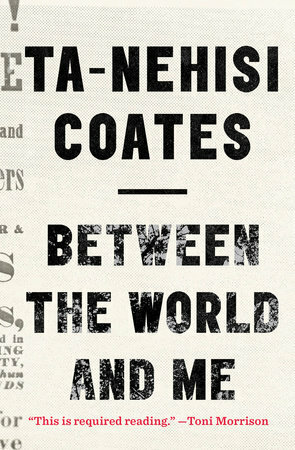 Right now I'm in the middle of Between the World and Me by Ta-Nahesi Coates, and I am eating up every word. I'm also still listening to Son of a Witch by Gregory Maguire. I really only listen to it while I'm coloring at lunch, so an hour here and an hour there. Finally, I jumped back into some comics this weekend. 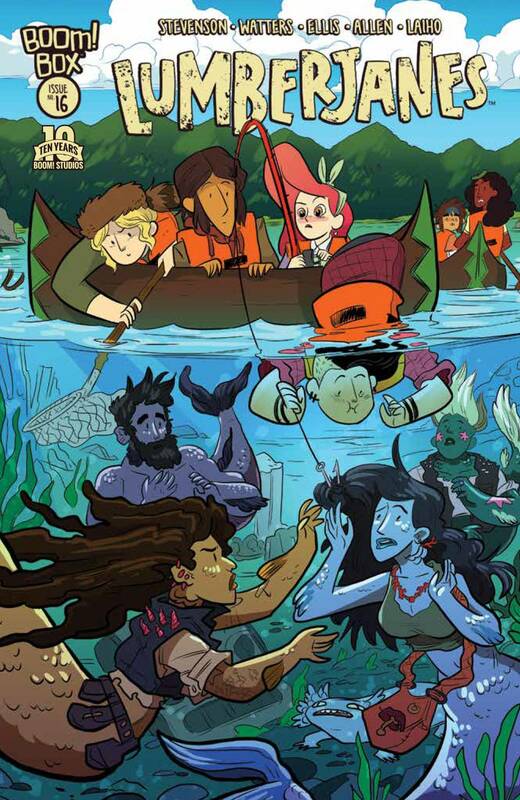 I read issues #15 and #16 of Lumberjanes which were especially delightful. I have plenty more waiting...Jem and the Holograms, Gotham Academy, and Edward Scissorhands. This time next weekend, we'll be on our way to Gulf Shores, Alabama for a 5-day beach vacation. I haven't been to the beach in years, and I've never been to Gulf Shores, so we're terribly excited. I may not be very active on the blog, but I'll keep you all up to speed on the sand, surf, and food over on Instagram. Tally ho! Have a good week, y'all! 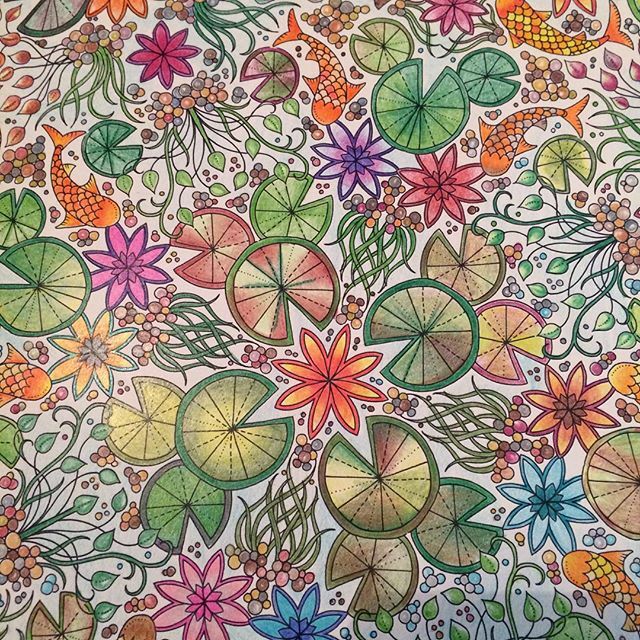 I'm having fun using all my many coloring pencils on each page. The next pageI do, I will be more selective and see how that works. Have fun! Coloring, coloring, everywhere. Enjoying seeing what everyone is accomplishing in that regard. Sorry about the cold. I thought I was coming down with something earlier this week - sore throat and aches and sinus issues. Guess it was just more allergies. They have not left me at all this year. I usually get a reprieve after the cedar is gone until the ragweed starts. But, the rain and the huge mold count has made this an odd year. Hope you guys have a nice vacation. I've think we've driven close to your destination while on our way to Florida at one time or another, but we've never stayed there. It couldn't be any hotter or more humid-ish than Texas right now. Five days at Gulf Shores sounds like paradise to me! I can't imagine how much you are looking forward to this vacation. I'm fascinated with the fascination with coloring. I'm really tempted to color. The kid in me, and the adult that needs to relax thinks it looks awesome. The chronic to-do lister with the phobia of being unproductive is scared I'd be thinking the whole time what I was accomplishing. Will I get over it? I've heard great things about Between the World and Me...I hope you enjoy it! Well, that's just not fair! I hope your cold goes away quickly. I'm jealous of your Lumberjanes reading! My library only had the first four issues, but I'm torn about signing up for something like Scribd for one comic! This whole adult coloring books thing blows my mind! I love your Secret Garden one...gorgeous...you should have that framed! And - enjoy your vacation! I still have not dug out my pencils and coloring books. They keep staring at me reproachfully. I did manage to take a nap, make a decent dinner and even one for Monday, and read. The reading is a good thing. I hope you have a relaxing week so that you can recover from that cold. No one should go on vacation with a cold! I love all the coloring pages. We've gotten into coloring here, too a bit. But nothing as fancy as yours. I REALLY need to get to Between the World and Me sooner rather then later. I pre-ordered it and then promptly shelved it. Oops. I am waiting for the Murakami coloring book to come out!! I always get sick when I have adult drinks. I think it lowers my immunity or something. Hope you feel better!